A complete kit for teaching skilled, attentive customer service. Ideal for anyone in the people business, this comprehensive set of training sheets covers all the key areas: understanding customer's motivations, emotions and triggers; building rapport; turning around a negative situation; staying motivated, keeping promises and providing the kind of excellent customer service that keeps them coming back. Has the Internet Made Customer Service obsolete? What Makes Customers Come Back? 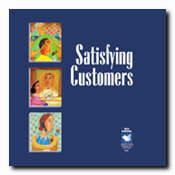 What Happens When Customers are Dissatisfied?